It's hot, as everyone will have noticed and I'm flying pretty constantly this weekend. So with very little time and even less energy remaining to write a blog post of any significance today, here's a passing photo of the Big Wheel on Brighton's seafront this afternoon. 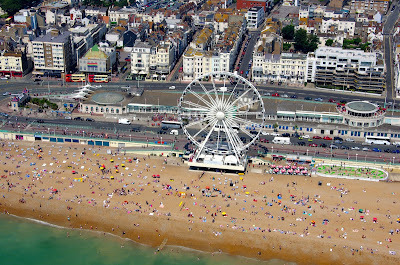 Perhaps we could organised a clever overnight commando raid, directed perhaps by the Thanet Gazette's new 'Political Mastermind' Will Scobie and 'borrow it' for Margate seafront or even better, the Pleasurama site, where it might look rather nice and perhaps attract a few more tourists and votes besides? Any volunteers with access to cutting tools and a small fleet of flatbed trucks? Just for the look on the faces of the members of Brighton Town Council when they find it's gone. This afternoon I was operating from Eastchurch airfield on the Isle of Sheppey. For a while there, you might have thought that the world had ended without anyone telling me; not a soul in sight anywhere, that is until I took off again and spotted the hundreds of caravans that line the shoreline as far as Sheerness. 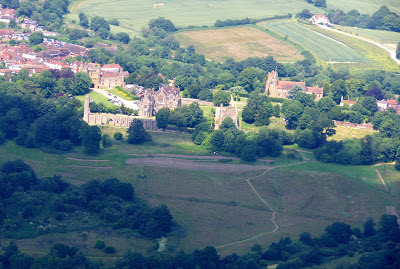 The other passing photo today shows Battle Abbey and the site of the Battle of Hastings in 1066 with Senlac Hill, where the Saxons stood, quite visible. Another even hotter day promised for Sunday. Make the most of it! Might be worth more as scrap metal to boost the Thanet coffers. But where would it go? Arlington Square? On Margate main sands bemused - just like the shot in Brighton? And Simon - give the word and I am sure we can find some young entrepreneurs in the area to help you. Just found some funny videos your readers may be interested in. Find them at www.facebook.com/InTouchWithThanet.